I don’t read as much mystery-thriller as I do sci-fi & fantasy, but this is one series I have been following religiously, and every book that comes out just makes me love it even more. Watcher in the Woods is the fourth installment that returns readers to Rockton, a secret town hidden in the wilds of the Yukon. Ex-homicide detective Casey Duncan and her boyfriend Sheriff Eric Dalton are doing their best to police this community of eclectic residents who share only one commonality—they’ve all come here to escape their pasts. But somehow, despite repeated assurances from the council that everyone in town has been vetted and deemed not a threat, dangerous criminals seem to keep cropping up in their midst. Rockton has only just gotten rid of their last serial killer when it turns out there may be another high-risk fugitive hiding in town. Worse, a US Marshall has come a-knocking, demanding Eric and Casey release this individual, whom he won’t name, into his custody. But how did this US Marshall—if he is who he claims he is—manage to find Rockton, when all the security measures and precautions put in place were supposed to keep them off the grid? And who is he looking for? Meanwhile, Casey also has her own secret she is trying to keep under wraps. Her good friend Kenny has been grievously wounded, and unfortunately, their town doesn’t have much in the way of medical care. Taking a great risk, Casey calls up her estranged sister April, who is a surgeon, and convinces her to fly in to operate on Kenny. But smuggling April into Rockton is sure to invoke the wrath of the council if they find out, and relations between the sisters aren’t exactly amicable after years of bitter resentment. There was a lot going on in this book, and I loved it. Having found some of the plot twists in the previous volumes to be a tad on the predictable side, I was glad to see Kelley Armstrong back on form with her terrific plotting and strong sense of timing. It’s a testament to her skills that this is the fourth novel in a series that takes place in the middle of nowhere and features only a limited number of characters, yet she still manages to fill each book with enough suspects and motives to keep her readers on edge and guessing at every turn. With Watcher in the Wood, I felt like I was constantly being hit with new developments and surprises from all sides, but in the best way possible. Even more amazing was how it all came together so marvelously. And speaking of the new elements introduced, I think my favorite one was the storyline involving April. Casey’s strained relationship with her sister has been a strong theme running through the series since the beginning, but only now are we seeing it so directly addressed and explored. While I thought it was a little unrealistic that it took only a town full of strangers a few days to diagnose and theorize a possible cause for the emotional conflict that has plagued the sisters all their lives, the whole episode still revealed an interesting side to Casey that we’ve never seen before. Of all the new characters Armstrong has brought in so far, April is the one I’m most excited about. I also like that this series continues to focus its attention on the mystery and thrills, with the romance being served like a delicious sauce on the side. The author hasn’t stopped developing the relationship between Casey and Dalton, but they’ve settled into a comfortable and loving place for now, and I enjoy reading about them even more for it. I feel much the same way about the setting, which Armstrong also continues to build and expand. In this book, we get to learn more about life in the Yukon, and that includes a quick trip to the town of Dawson City. We also get more information about the inner workings of the council and glean clues that support the possibility of them being compromised, setting up potential storylines for future books. In conclusion, Watcher in the Woods was another fantastic sequel in a series that has captured my attention in so many ways. Mystery, action, romance, and suspense—Rockton has it all. Once more, Kelley Armstrong has me waiting on pins and needles for the next book. Audiobook Comments: This is a series I adore in audio, and the main reason for that is Therese Plummer, a narrator extraordinaire who has proven herself to be the perfect voice for Casey Duncan. She delivered an awesome performance as always, and I look forward to listening to her read again for the next book. 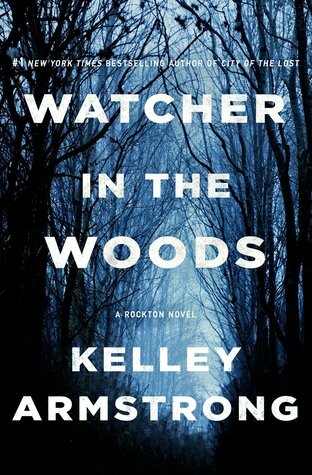 This is definitely a series I’ll start some day, plus I’m a big fan of Kelley Armstrong’s paranormal fiction. Haha, I still have yet to try her paranormal novels. I really should. I need to read book 2 one day! Your previous review of the other books in the series never failed to catch my attention, and one of these days I will need to try this series, indeed. There was a time, before I chose to read mostly SFF, in which I enjoyed mysteries and thrillers very much, and this series looks like the perfect way to recapture that old passion. Ok so I need to try Armstrong again! She’s marvelous, I only read her for the first time a couple years ago and I regret not starting sooner. I’m reading this one now and so far I love it. As usual haha. This series is awesome! That’s great! I really loved this one, probably my second favorite after the first book. The good news is, they’re so fast-paced and addictive, they go quick. While the little side dish of romance sounds good, I’m still sort of skeptical about it hahah Otherwise, this sounds absolutely dark and awesome! Great review as always! I like the sound of these and have bought the first and second instalment so we’ll see how I get on. Eee! I hope you get to start them soon because I’m so curious to know what you think! I can read english book almost as easily than french books, but hearing them it’s too challenging. So, not this one. Kelley Armstrong is one of those authors I have always meant to read but have never gotten around to. Glad you enjoyed this one!